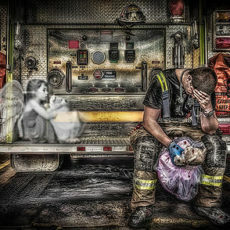 On this day of mourning, I mourn the loss of First Responders in BC to suicide. BC has the highest level of suicide of First Responders in the country. Dressed to the nines in uniform. They’ll often travel across the country to march in a First Responder Funeral on Parade. Any suicide death of a BC First Responder due to Operational Stress Injury and resulting PTSD, Depression and often Addictions is a Workplace Death. I honour those who’ve fallen: This serves as a memorial statement. One we are yet to see made on all the memorial walls standing to honour fallen First Responders who’ve perished due to other ways to die. I honour this week all fellow First Responders now living with a permanent disability. Thank you, all, for your service. Be Well those still alive. Rest Well those who have died. I wish to thank those moderating this memorial page for agreeing to post my dedication. The issue of suicide in First Responders in BC is a difficult subject for all in society to face. Reality of the issue of PTSD must be expressed if we’re ever going to move forward to witness the radical change in understanding Operational Stress Injuries across the community that makes up workers in Public Safety in Canada. Again, I thank you for the post, and for provision of this memorial page to honour all who’ve perished, and those left standing with the permanence of disability PTSD still far-to-often imposes on it’s victims.